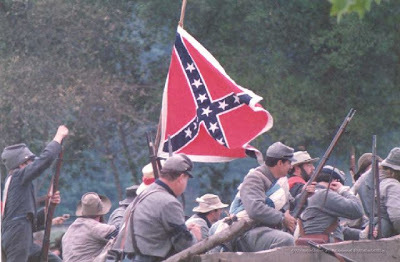 Boogie Man Journal: Should the North Celebrate the Defeat of the Confederacy? Should the North Celebrate the Defeat of the Confederacy? This year marks the150th anniversary of the start of the Civil War (South Carolina seceded in December, 1860; the conflict began in April, 1861), and the former rebel states are planning to go all out for the next -- God help us -- four years. Confederate flags will appear almost everywhere, battle re-enactments will take place, gala balls and parades will be held in southern cities, and the proud, delusional state of Alabama even has plans to throw a Jefferson Davis mock swearing-in ceremony, featuring a Jeff Davis look-alike. The South is probably the only place in the world that celebrates its defeat in a war. One does not see the Germans rejoicing over the invasion of Poland; the Japanese let Pearl Harbor Day pass without fanfare; the British don’t have parties on the anniversary of the Boston Massacre. Of course, southerners bend over backwards to assure us that the subject of slavery is somehow unrelated to the Civil War. It’s supposed to be strictly a states’ rights issue, they insist. Which is a little like saying the Spanish Inquisition was about Papal attire. To use the southern phrase -- that dog don't hunt. The fact that secession was also treasonous and ultimately resulted in the deaths of 620,000 Americans seems also to have escaped the selective memories of our southern brethren. Let’s not forget -- they started it. Wake up and smell the mint juleps, y'all. The North won the war fair and square. Stop acting like you did. It's a little pathetic. It's also offensive to just about everybody else in the nation. People protest and write angry OpEds, but every year that hateful flag finds its way out of the moth balls and into the street. Which begs the question: Since the North actually did win the war, shouldn't we be the ones having the celebration? 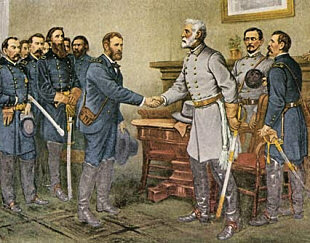 We could call it “Appomattox Day.” Every April 9th (the day of surrender in 1865), we could find a guy with a grayish beard, put him in a gray uniform and watch him hand his sword over to a bearded guy in a blue uniform. We could re-enact Gettysburg and Lincoln's inaugurations; school children could sing “The Battle Hymn of the Republic.” We could have ceremonies that honor Frederick Douglass, Dred Scott, William Lloyd Garrison and John Brown. If Southerners find this offensive, they could always stuff cotton in their ears, which seems to be what most of them did during history class.